L-R: John Snyder, BCD Travel; Alexandra Garcia, World Central Kitchen; Mariano Lozano, Danone North America; Dan Amos, Aflac; Steve Rendle, VF Corporation; JC Lapierre, PwC; Shana Deane, 3BL Media. WASHINGTON, D.C., March 11, 2019 /3BL Media/ - The deadline to submit speaker proposals for the 2019 3BL Forum and your nominations for the 2019 Responsible CEO of the Year Awards are fast approaching. The 2019 3BL Forum: Brands Taking Stands™ – What’s Next will be held at MGM National Harbor, just outside Washington, D.C., Oct. 29-30. The CEO Awards and Recognition Dinner will be held on October 29. All organizations and individuals who wish to be considered as a main stage participant at this annual gathering of purpose-driven corporate leaders must submit a speaker proposal application by Monday, April 1, 2019. 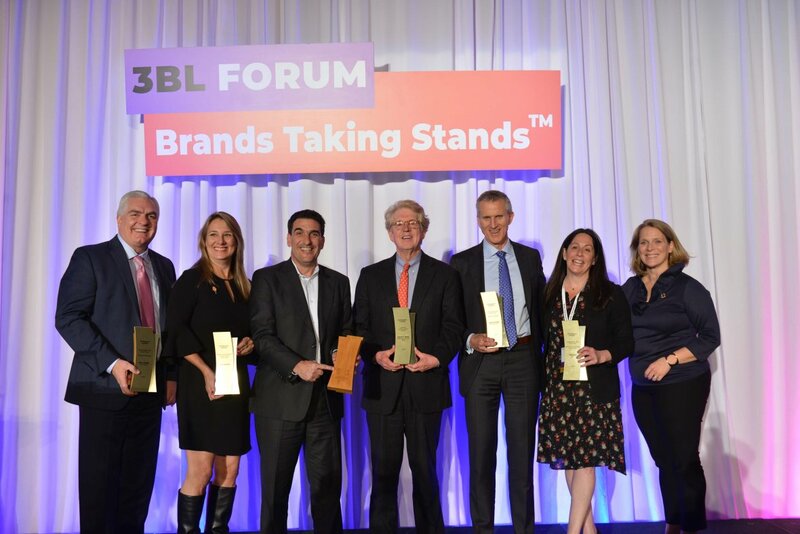 The theme for 3BL Forum is “Brands Taking Stands – What’s Next,” focusing on the business drivers behind innovative and impactful corporate responsibility programs that are increasingly including social activism. If you would like to nominate the CEO of a public or private company for the 12th Annual Responsible CEO of The Year Lifetime Achievement Award, download the nomination form and email it to ResponsibleCEO@3blmedia.com by Sunday, March 31, 2019. The Responsible CEO Awards are unique among business honors because it recognizes how individual CEOs take an active role in aligning their organization's interests with their stakeholders to do well by doing good. The CEO Awards acknowledges this leadership continually evolves as corporate social responsibility now takes center stage in business. In addition to the CEO of the Year Awards, CR Magazine's 9th annual Lifetime Achievement Award will recognize a CEO whose risk-taking, vision and pioneering spirit have led to significant achievement in the Corporate Responsibility field over the course of their career. All award winners are nominated by fellow members of the Corporate Responsibility community and selected by an independent panel of judges composed of previous winners and other recognized leaders.